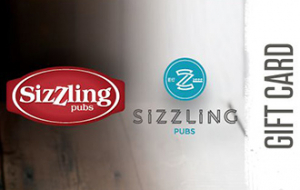 Welcome to Sizzling pubs, where good food and drink, great value and a generous serving of sizzle are always on the menu. Whether you're looking for a fun family meal out or somewhere to watch the footy with a few mates, you'll find a Sizzling pub to suit you - and with prices that are as easy-going as the atmosphere. This card may not be exchanged for cash. This card is not a cheque guarantee, credit, debit or charge card. No change will be given but the balance can be used for future purchases. We will not be held liable for lost or stolen cards - protect this as you would cash. To check the balance of your giftcard please visit www.sizzlingpubs.co.uk/giftcards A giftcard is valid for 12 months from the date of purchase. This card is valid for use at Sizzling Pubs only. Gift cards can be purchased with a minimum value of £10, up to a maximum of £250. SMS and email gift cards should be treated as cash. If deleted they will not be resent. SMS gift cards will be free to receive for the guest. Email gifts are valid either presented on a smart phone or printed out. We reserve the right to amend the terms and conditions. Further terms and conditions are available upon request.